You'll be ready to take on any competition with the Nike® Dri-Fit™ Crew Socks, they'll keep your feet cool during all the heavy game play and won't slouch so you can stay focused on the game. Crew cut length sits at calf. Ribbed cuff with Swoosh design. Right and left foot specific for enhanced fit. 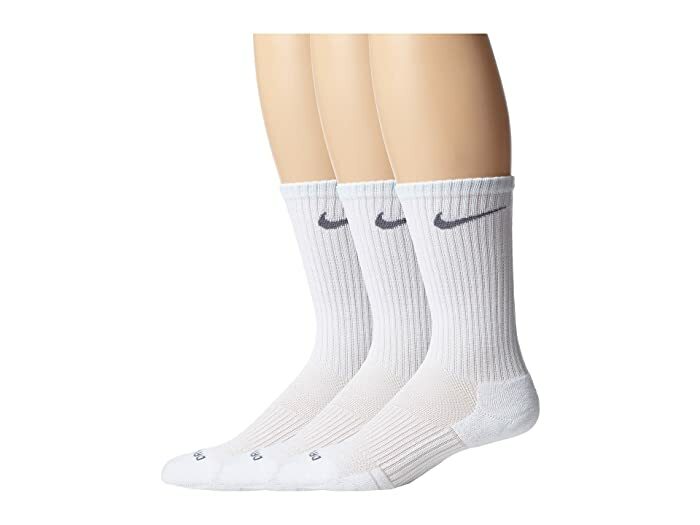 Dri-FIT fabric wicks away moisture to keep your feet dry and comfortable the whole time. Premium cotton for durable construction and a lasting soft touch. Arch compression for a secure and stable fit. Reinforced heel and toe areas for improved longevity. 57% polyester, 30% nylon, 11% cotton, 2% spandex. Please note: material breakdown may different from color to color.